Chris Gayle is under pressure to score runs on day three of his 100th Test. After two days in Kingstown, Chris Gayle probably wishes his team won the toss and batted. Kane Williamson (113 runs) and Jimmy Neesham (107), along with a great supporting cast, have stolen the show from the West Indies’ prolific opening batsman who is playing in his 100th career test match. New Zealand declared at 508 for 7 in 174.3 overs. Gayle picked up 8 runs as West Indies was 19 for no loss after nine overs to round out day two. 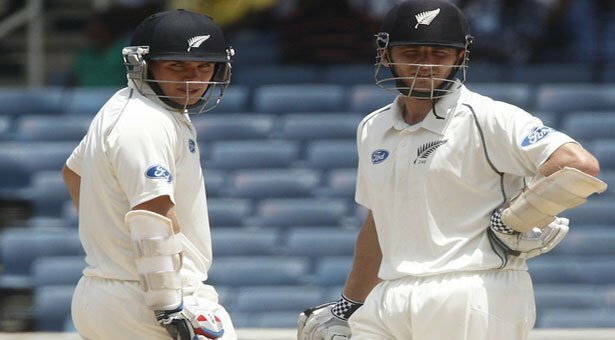 Williamson and Neesham each scored tons throughout days one and two of the first test of the tour. The Windies have shown the ability to win the first session of the day by keeping runs at a premium on day one and picking up wickets on day two, but on each day, the Blackcaps’ batsmen took control in sessions two and three. On day one, 22-year old Tom Latham looked a seasoned veteran. In only his second test, the youngster saw off 206 deliveries for 86 runs. Latham looked confident scoring 48 of his runs to the off side. Five of his ten boundaries went behind him to third man and fine leg. The rest was well-timed off drives. Latham particularly enjoyed the deliveries of Shane Shillingford, scoring 31 off 77 from the Windies’ off breaker. Another talented, young New Zealander is 23-year old Kane Williamson, already playing in his 32nd test. Williamson earned his sixth career test century seeing off 298 balls for 113 between days one and two. Williamson found all but two of his 12 boundaries on the off side, happily spraying the ball anywhere between third man and long off. A total of 74 of his 113 runs were scored on the off side. Williamson scored 44 runs off Sulieman Benn. West Indies are quite obviously missing the presence of Sunil Narine, who is likely enjoying the gleam of the IPL trophy with his Kolkata Knight Riders teammates. By the time day one came to an end, New Zealand were 240 for 2. Peter Fulton went down in the ninth over while Tom Latham held strong until the 71st. Day two commenced and within the first session, Williamson, Ross Taylor, and Brendan McCullum all saw their wickets fall. Benn got his revenge on Williams by taking his off stump; Williamson lost his concentration and let a slider go through without offering a shot. Taylor went softly in the 111th when he flicked one to midwicket, wasting a good start of 55 runs. Only one over later, Brendan McCullum was a victim to the turn and bounce on the Sabina pitch. A bounce off the keeper’s chest landed safely in the arms of Chris Gayle at slip completed the captain’s dismissal. From then on, BJ Watling and Jimmy Neesham owned the day. Neesham became the ninth player in the history of Test cricket to score centuries in each of their first two matches joining Bill Ponsford, Doug Walters, Alvin Kallicharran, Mohammad Azharuddin, Greg Blewett, Sourav Ganguly, and Rohit Sharma as the only others to do it. The 23-year old made some noise in the 137th over with a pair of sixes off Shillingford. Both went straight down the ground over the bowler’s head. His century came in the 167th over, sharing the strike with BJ Watling. A nick off an outside edge was Neesham’s demise only a few deliveries after Watling (89 runs) launched a beautiful six over mid on. The Neesham and Watling partnership was worth 201; building on Williamson and Latham’s foundation partnership worth 165. A Tim Southee bomb to midwicket brought up 500 for New Zealand. Watling was dismissed in the 175th over. Looking to score his century before declaring, he over-aggressively lofted one to midwicket. 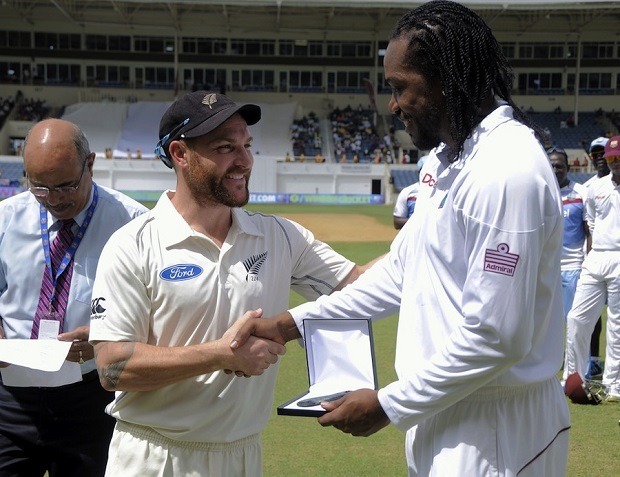 New Zealand promptly declared and in came Gayle, the ninth West Indian to play 100 matches, and Kieran Powell, playing in his 21st. Gayle got off the mark on the last ball of the third over, his 12th delivery seen with a boundary. Powell was dropped at slip on 8, but the two survived nine overs and had 19 runs to show for it. Gayle is under pressure to play an important knock to keep the Windies in the game. Any added pressure from playing in his 100th test will only add to the drama on day three.